These master links are very similar to Crosby's popular A-342 Alloy Master Link, except with one key difference. A-344 links feature an "engineered flat", which is a spot on the link that if flattened during the manufacturing process to alloy use of Crosby's S-1325A Chain Couplers (sizes up to 1-7/32" only). Additionally, these links feature generous interior dimensions for use with most crane hooks in the field. Made from forged alloy steel, Quenched and Tempered. Each link is individually proof-tested with 60% inside width special fixtures sized to prevent localized point leading per ASME A-952 (see PDF attachment for actual Proof Load applied), and satisfies ASME B30.26. Type approved to DNV Certification Notes 2.7-1 Offshore Containers, 100% proof tested, MPI and impact tested. 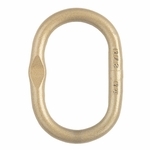 For use with chain slings, refer to the PDF attachment for ratings and proper master link selection. Safety factor of 5:1.